A bullish day for Aussie equities with the market latching onto strength from our cousins across the ditch, simply ignoring the weakness playing out across US Futures while Asia was fairly mixed across the board. 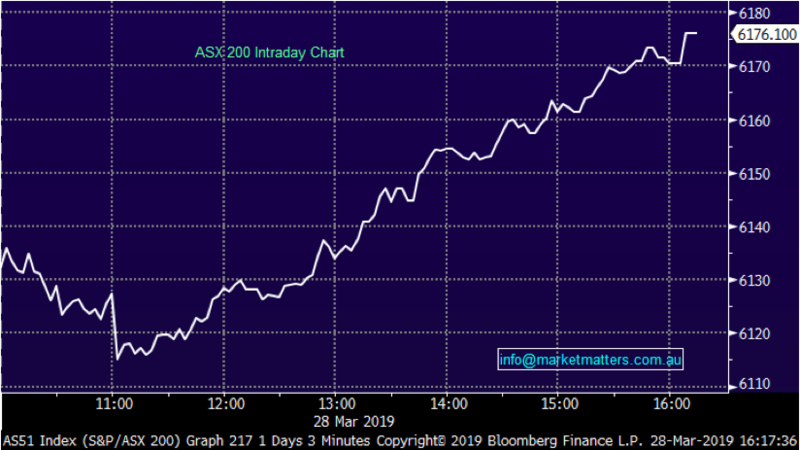 It’s been a while since we’ve seen such sustained buying throughout the day with the ASX 200 running hard from its 11am low – a move of +61pts bought from early weakness after the market pulled back -21points in early trade. Rally’s like that often come from left field and dealing with into traders around the market today, it caught many on the hop – probably why it was sustained buying / grinded higher into the close. As we alluded to earlier in the week, a heap of dividends being paid this week and money clearly finding its way back into the market + we had stock options expiry today which adds a bit of spice to things . 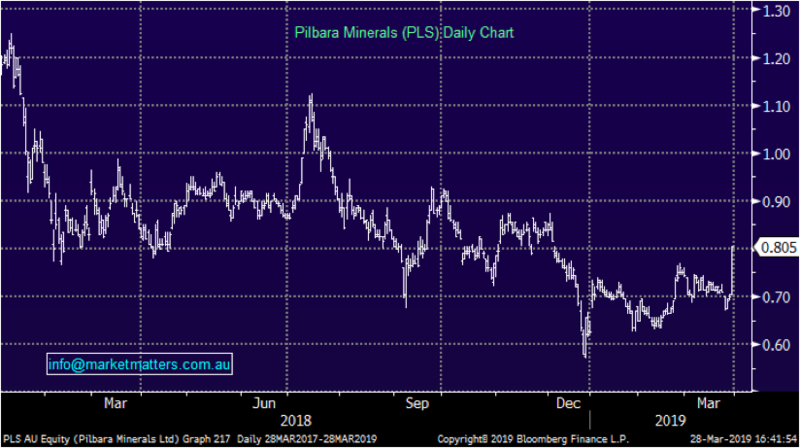 A lot going on today across the desk with stock options expiry along with some large portfolios going through the screens – the grind higher from the lows showing clear buyer interest across the market. 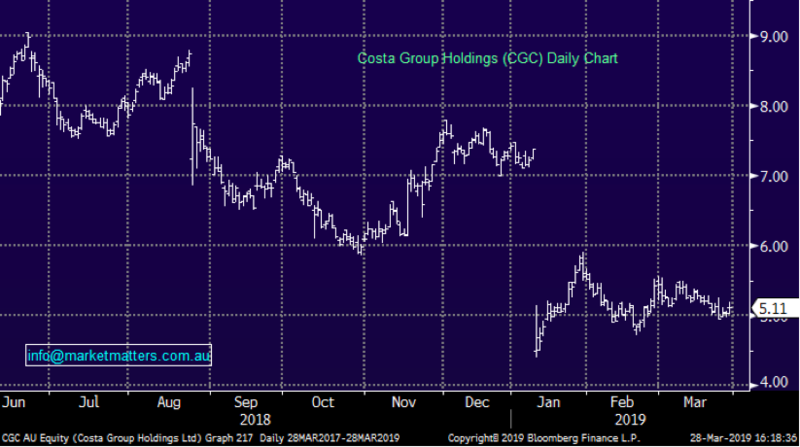 A few stocks from a trade / price perspective catching my eye…Some of the beaten down value plays starting to run, the agricultural sector for one with Costa (CGC) covered below doing well, Elders (ELD) put on +3.07%, G8 Education (GEM) saw some decent buying into recent weakness adding +3.45% while Emeco (EHL) traded down to a marginal new low and bounced pretty well, closing down ~1% at $1.905 on the session but up from low of $1.855. 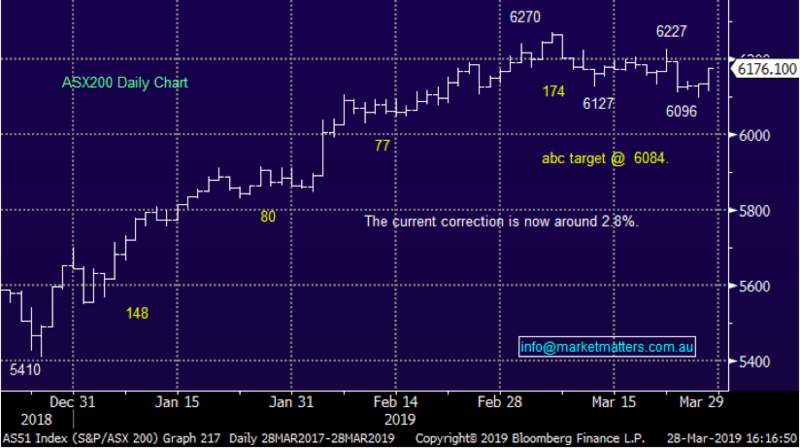 We also saw a lot of action early between Coles (COL) and Wesfarmers (WES), with COL’s sold hard only to recover while we saw strong, sustained buying in WES throughout the session – looked like decent money coming out of COL and into WES early on before buyers stepped up into Coles. 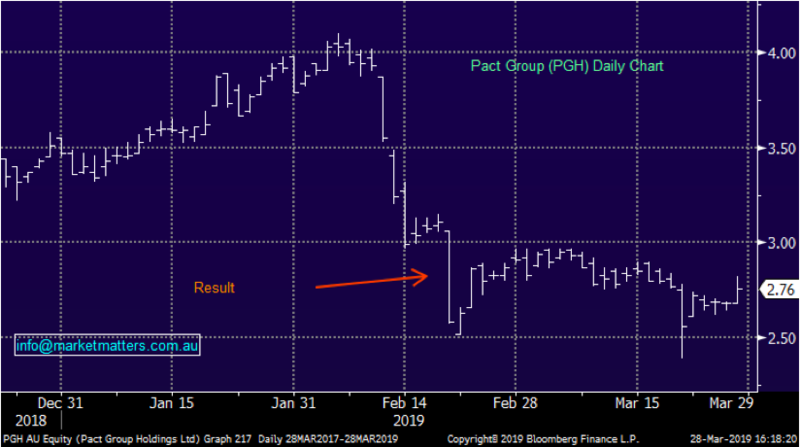 Pact Group (PGH) +2.99% announced a new MD this morning and the stock was bid up on the back of it. A fairly muted open however as the news worked across the market buyers stepped in. While not earth shattering, the appointment of the Sanjay Dayal as Managing Director and Chief Executive Officer is an incremental positive, poached from the executive team at BlueScope in time to take the reins from stand in CEO and current Chairman Raphael Geminder next week. He joins the packaging group at a time where earnings have gone backwards as rising input costs hit. The stock traded as high as $5.95 last year before a profit warning sent the stock tumbling. Sanjay has been brought in for his extensive innovation and restructuring experience at both Bluescope (BSL), and prior to that Orica (ORI). The task at hand will be to lower production costs while trying to protect earnings from the swings and roundabouts of resin pricing. We own PGH and see plenty of upside if they can get this right.